Why consider a custom sandblast cabinet? When it comes to a sandblast cabinet, one size does not always fit all. 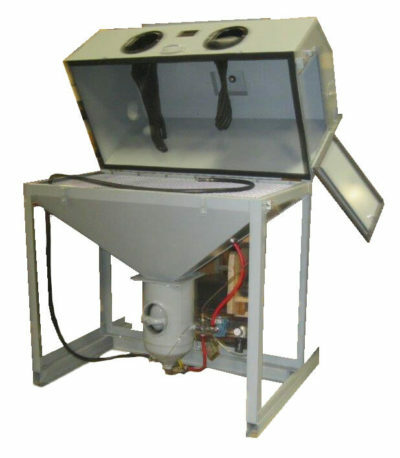 As a result, we provide many sizes of small to industrial size sandblasting equipment. Even with these choices, many circumstances need more than just a standard cabinet size. Because Cyclone has a complete metal and paint shop we can accept a custom design sandblasting solution for you. Need a taller cabinet? How about a wider cabinet? Rollers or turntables? What about dual sandblast or bead blast guns and dual sandblast gloves? What about a triple workstation? Our process, as any, begins with your needs. For example, imagine you are trying to accommodate a motorcycle chassis in a cabinet. First, you need to consider how to get the chassis into the cabinet. As a result, a full top opening machine would likely be a great fit. A full top opening system opens much higher. Thus it lets larger pieces fit inside! Another option may be special side doors. Although most Cyclone standard cabinets have large side doors, your circumstance may require larger doors. We can help you with this process. Simply let us know what you plan on putting inside, and we can develop a custom solution for you. This is one of our most recent designs. 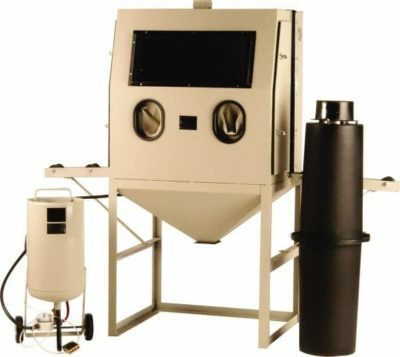 A custom designed 48″ direct pressure abrasive media blasting cabinet. Using our client’s specifications we manufactured this solution in very short time. Whether you need a tall cabinet, wide cabinet, or components inside the cabinet – we can do it. Just let us know your needs and we will discuss it. Looking for a way to semi-automate the blasting process? 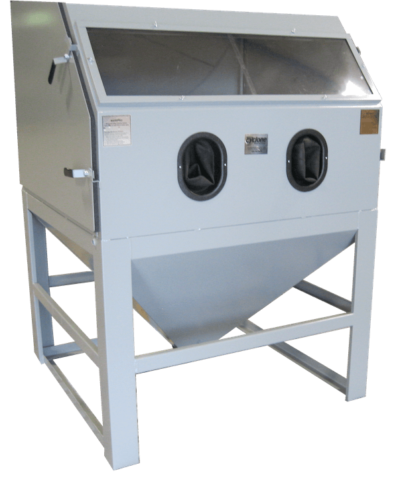 While we do offer a tumbling sandblast cabinet, we can also expand our tumbling features to a cabinet design you specify. As a result, you can count on our solution to work as hard as you do. Drop parts in a basket, switch the unit on, and come back to perfectly blasted parts. Sometimes users need to pass their parts completely through the cabinet. As a result, we have custom options that allow large work pieces to easily pass through cabinets. Some examples where this is most convenient is large pieces of glass or stone. By using rollers that easily glide, the part simply rests and slides as needed while being blasted inside the cabinet. And as an added benefit, the abrasive dust and debris remain in the cabinet! Whether you need a small, large, or industrial sandblast cabinet we can help. If our standard issue sized cabinets do not meet your needs, we may be able to help create a custom solution ideal for your purposes. Dual guns, dual sandblast guns? We can do that. Following your guidelines we can create a solution unique to your application. We would love to hear from you about any custom cabinet designs you are interested in. We can work with you over the phone or by email. As an initial action, please complete the form below and we will get back to you as soon as possible. Please feel free to share your idea. Height, width, length, number of guns or pedals, etc. Thank you!